Out of all the seafood varieties, shrimp is my favorite to cook. I guess its because shrimp cooks really fast and requires very little prep time. I often serve shrimp and salmon together over a bed of rice. Today I decided to blend in some Thai flavors with those of south Indian Cuisine. 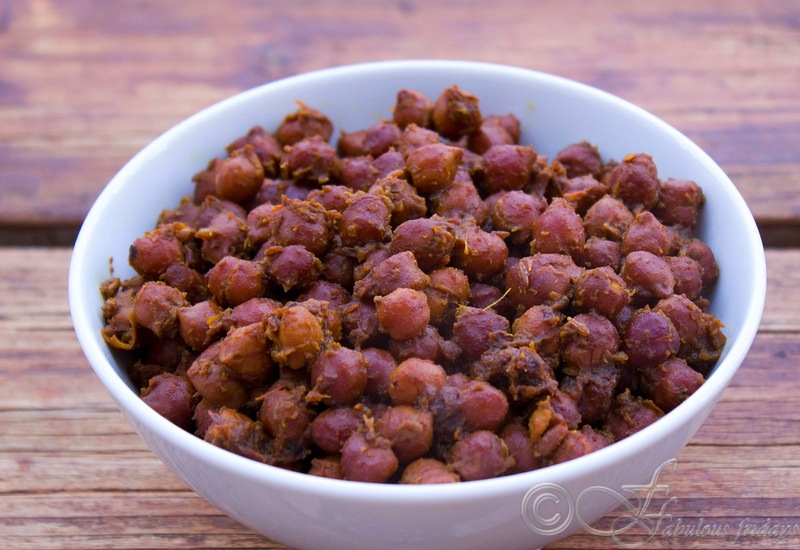 In both there is use of tamarind and peanuts and these recipes incorporate one or both. 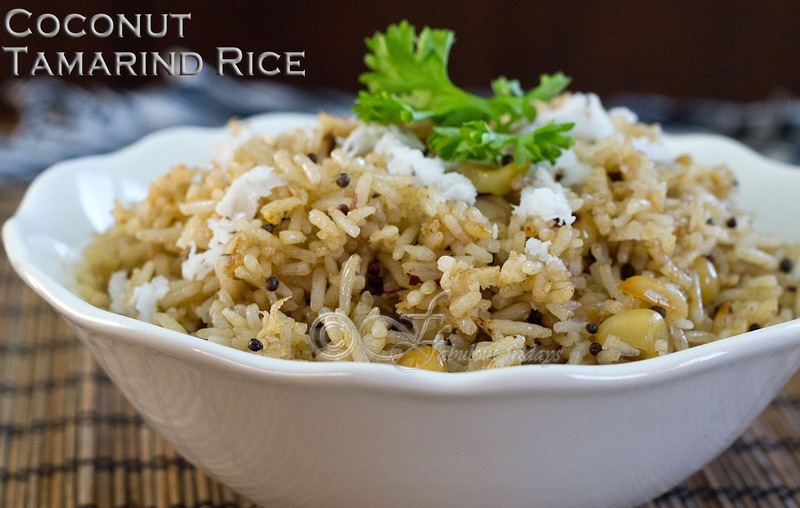 Specially the rice which binds the whole meal together and gives an infusion of flavor in each bite. Wash rice thoroughly and add 2 cups water and salt. Bring to boil and simmer covered for 10-12 minutes till rice is cooked and all liquid is absorbed. Fluff with fork and keep aside. In a pan heat oil and add mustard seeds. Let them sputter for 15 seconds. Now add peanuts and red chilies and stir for a minute till peanut roasts. Add coconut, green chilies and ginger and roast for a minute to very lightly color the coconut. Add the boiled rice and blend everything together. Tamarind is used to give the dish a slight sour taste. Now add the tamarind paste according to desired taste and mix well. This marinade is a delicate balance between the tart sourness of tamarind and sweetness of honey with a hint of saltiness. You can adjust these flavors in your marinade according to your taste. In a saucepan put all the ingredients for marinade and bring to boil. Simmer for 2 minutes while stirring. It will thicken up a bit. Keep aside to cool. Peel and de-vein the shrimps. 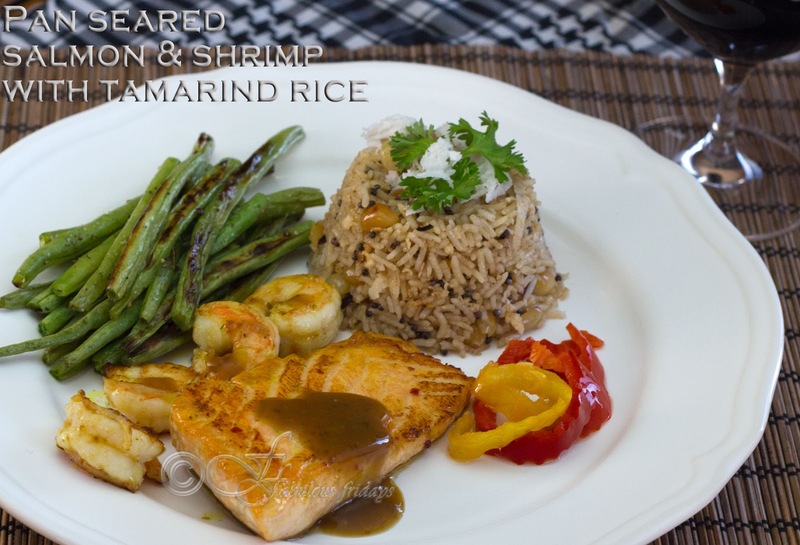 Spoon this sauce over seasoned salmon fillets and shrimps. Marinate for 15 minutes in the refrigerator. Put a large pan to heat for 40-45 seconds on medium high heat. Then add 2 tablespoons of vegetable oil and move the pan around to coat evenly with oil. These above step are necessary to prevent the fish from sticking to the pan. Gently place the fillets in the pan. Cook the first side undisturbed for about 2 minutes covered. This will allow the fish to turn easily without sticking. Cook 2-3 minutes per side depending on the thickness of the fillet. The sides of the fish will become white ( no longer transparent ) when done. Take them out of the pan and keep aside. In the same pan add the shrimps in a single layer without crowding the pan. Cook for a minute each side until no longer transparent. Serve both fish and shrimps over rice. 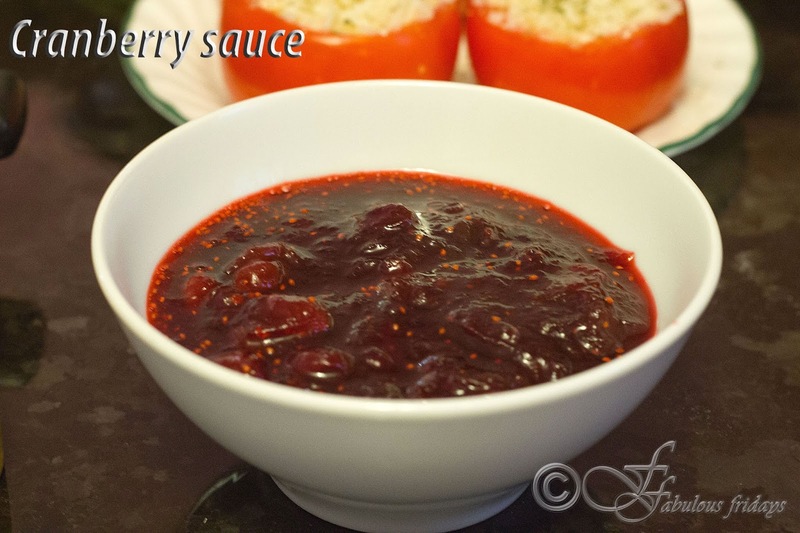 Some of the sauce can be spooned over the fish for an enhanced flavor. This evening we had friends over for dinner. Everyone was very relaxed ﻿and in a chatty mood (as always). Amidst jokes and Kishore Kumar songs, we started off with Symphony (a light bodied caliCaliforniante) and lime punch. Starters were simple and light. We had spanakopita, cheese-onion filo bundles and cold shrimp with beetroot-carrot salad. Dinner was the standard Indian spread with kasuri methi chicken, kadai paneer and punjabi kadhi (my fav) accompanied by roti, rice, onion relish and papad. It was an apple cake for dessert. Here are the recipes. In a large pan heat oil at medium heat. Add garlic, ginger and green chilies and fry for 30 seconds till garlic gets pink. Add kasuri methi and stir. Add the chicken pieces and all the spices. On medium heat fry the chicken turning occasionally for about 10 to 15 minutes until chicken leaves some oil in the sides of the pan. The chicken should be browned lightly and should be completely cooked from inside. At this point, there should be very little liquid left in the pan. Remove from heat and add the sour cream. Stir well and enjoy with roti or naan. 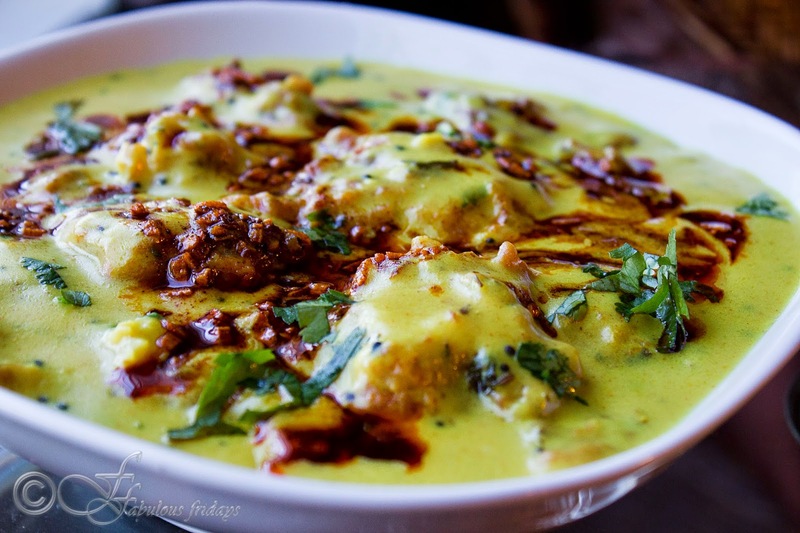 Kadhi is an Indian dish made in several parts of India. It is a spicy yogurt based gravy which often contains chickpea flour and vegetable dumplings called pakoras, and is served in combination with rice. There are several versions of kadhi and each version has slightly different ingredients and spices. I made the punjabi kadhi which is a traditional recipe for the northern region of India. Mix all above in a bowl and make a smooth thick batter of a droppable consistency. Drop one-inch diameter dumplings into the oil and deep fry on a medium heat. In a large mixing bowl take besan and add the yogurt to it. mix well. Add water and salt, turmeric and coriander powder and mix well making sure there are no lumps. Keep aside. 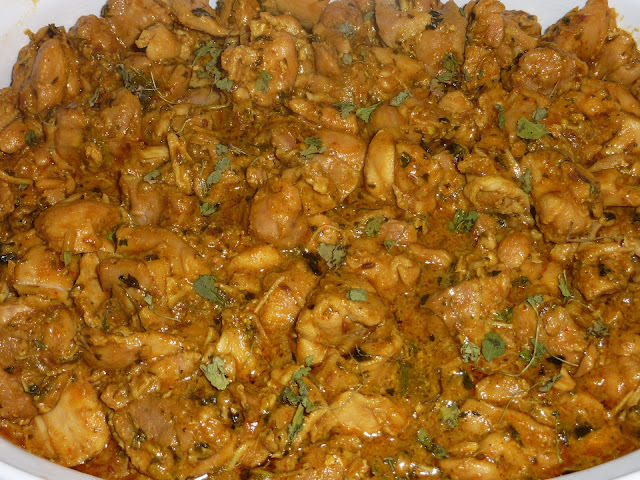 Remove from heat and put a tempering (tadka or baghaar) of ghee and garlic and red chili powder. In a small pan heat oil and add cumin seeds. Let sputter for 20 seconds. Add ginger and garlic and stir for a minute. Add tomato puree and a little bit of salt. Also, red chili powder if desired. Stir and cook on high for 3-4 minutes till tomatoes get cooked, water evaporates and oil leaves the side of the pan. Keep aside. In another pan heat oil and add kasoori methi. Stir for 10 seconds. Add cubed paneer and on medium heat lightly fry them till they turn golden. Add the peppers and all the spices. On high heat stir well till the peppers get a little crispy, for about 2-3 minutes. Now add the tomato sauce and coat well. Take out of the heat and add the sour cream and mix. Garnish with fresh green coriander and serve with roti or naan. Today is navami, the ninth day of the navratri festival. Navratri literally means nine nights in sanskrit and this festival is dedicated to Goddess Durga. Durga is the personification of the divine shakti (energy or power ) of Lord Shiva. and is worshipped in her nine forms. Every year during the lunar month of 'ashwin' hindus observe ten days of rituals, beginning with the fasting of navratri and ending with the festivities of Dusshera. This festival is celebrated in different ways in different parts of India. In north India the most popular offering made to the goddess is poori with halwa and chane. On the eighth day devotees break their fast and worship little girls (between the ages of 2-12) as the goddess herself by offering this food along with some little gifts and/or money. This was the inspiration for dinner tonight. In a pressure cooker pour oil. whet hot add cumin seeds and cloves and let them sputter for 10-15 seconds. Add tomato puree and ginger and all the spices. Mix well and stir for 2 minutes till tomatoes cook a little. Now add the chane along with the water. Since its a dry dish make sure water is levelled with the chane in the pressure cooker so that its enough to not burn the dish but isn't too much to make it runny. Mix well and close the lid. When the pressure cooker whistles, reduce the heat to low and cook for 25-30 minutes. Remove from heat and carefully open the lid. If there is excess water then cook on high while constantly stirring till the water evaporates and chane leave some oil along the sides. Garnish with fresh coriander leaves and serve hot with poori or roti. Pack spinach in a blender and puree it using as little water as possible. In a deep mixing bowl or a food processor take the flour and add salt, ajwain and ghee. Work the fat in well so that the flour resembles breadcrumbs. Too much fat here will give problem while frying. Add the spinach puree and knead the flour into a hard dough. In most cases the liquid in the spinach puree will be enough. If not then add some water. Make sure the dough doesn't become too soft. Divide the dough into small lime sized balls. Roll the dough into a circle of aprox. 3 inch diameter. Gently immerse it into the hot oil. The poori will puff up, then turn it over to cook on the other side till golden in color. In Canada thanksgiving is celebrated on the second Monday in October, where Canadians give thanks for a successful harvest. It is customary to get together with your family for a thanksgiving meal and celebrate on any one of the three days of the long weekend. 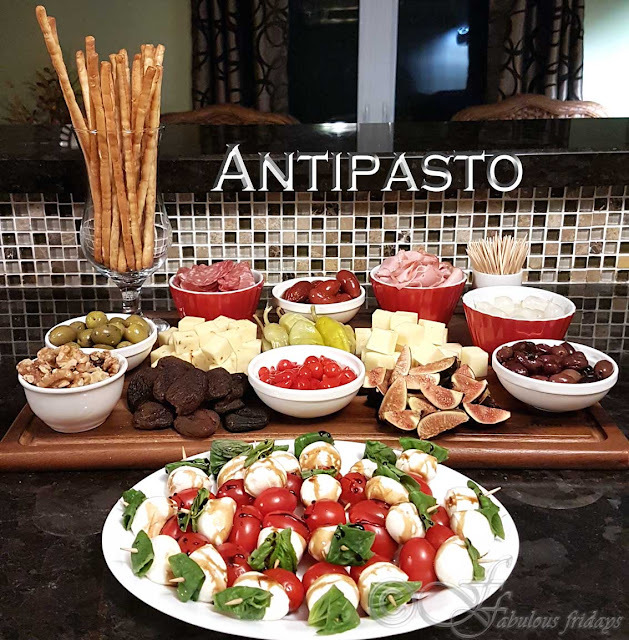 The celebration mainly revolves around a large thanksgiving meal and the centerpiece of this meal is usually a large stuffed and roasted turkey. A number of sides are served such as squash, yams, mashed potatoes, green beans, peas and carrots, cornbread, cranberry sauce, stuffing and gravy. For dessert various pies are served especially apple pie, pumpkin pie, pecan pie, mincemeat pie. Non fermented apple cider and wine complete and complement the meal. This Friday I decided to cook up a thanksgiving inspired dinner, being so close to the weekend it seemed like a great idea and my girls loved the spread. They even helped by peeling and slicing the apples. Instead of the turkey I made the stuffed chicken breast with spinach, green onions and ricotta cheese as the main dish. Manageable in quantity with no leftovers and quick cooking time are some of the advantages over a large roasted turkey since we were only five people for dinner. Garlic mash and green beans with bright and tangy cranberry sauce complemented the chicken in flavor and color both. In a pan heat olive oil and add garlic. Sauté till pink and add green onions. Cook on high stirring constantly for 1 minute. Add spinach and salt and stir on high heat for 2-3 minutes till spinach wilts a bit and all the moisture disappears. Add the black pepper and thyme and allow the mixture to cool. Add the cheese and mix well and keep aside. Meanwhile keep the chicken breast between plastic wrap and pound with a mallet to flatten them a bit such that the thickness becomes a quarter of an inch all over. Season them with salt and pepper and divide the spinach mixture between the four chicken breasts. Roll the chicken breast and secure firmly with toothpicks or kitchen string. This will prevent the stuffing from coming out while cooking. In an oven proof pan take some olive oil and heat it at high. Brown the stuffed chicken on both sides for a minute each and then transfer the pan into the oven. Cook for 15-20 minutes till chicken is no longer ping from the inside and the internal temperature reaches 175 F.
Grill them on the top rack on high for 15 -20 minutes. They should brown just a bit and cook but still retain some of their crispness. Boil the potatoes and garlic till potatoes are tender. Drain and peel the potatoes and place them along with garlic in a large bowl. Mash well till potatoes are creamy and lump free. I like to pop this under the broiler for 5-7 minutes to give a slight texture and color on top. Place sugar and water in a pan. Add the cranberries and salt and bring to boil. Cook stirring occasionally on medium heat till thickened and most of the cranberries have popped about 7-10 minutes. Keeps well covered, refrigerated for a week. Put the juice of one orange in a measuring cup and top with water until you have 3/4 cup liquid in total. Continue with the above recipe using orange juice water mixture in place of water. Add a tablespoon of chopped rosemary to the concoction and follow the basic cranberry sauce recipe to get this very festive flavored side. Add one cinnamon stick and 5 whole cloves to the concoction and follow the basic cranberry sauce recipe. When completely cool, remove and discard the whole spices before serving. One of my most favorite of the Mughlai dishes is Biryani. A complete meal on its own this dish pleases both adults and kids alike. It infuses a number of different flavors all at once and gives you a truly royal experience. Layers of long grain basmati rice (steamed or fried) are baked together with curried meat or vegetables resulting in an intensely flavored dish. The name Biryani is derived from the Persian word birian which means “fried or roasted” and has its roots in the Persian cuisine. There are many legends regarding its movement to the Indian subcontinent. Some believe it was brought to India by the Muslim merchants and travelers and made popular during the Mughal rule in cities like Lucknow, Hyderabad and Kashmir. Some believe it traveled across the Arabian Sea with the Arab travelers. Some believe it was devised as a dish to feed a large army and was cooked in a large earthen pot sealed with dough. In India almost every community has its own version of the Biryani and each one is as royal as the other. As it evolved different ingredients found their way into this dish. 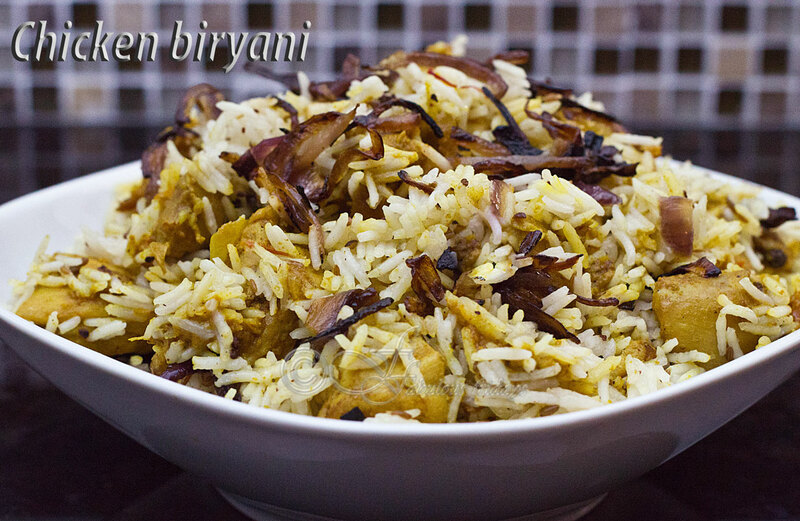 Now you can make Biryani with lamb, chicken, beef, egg, shrimp and even fish. 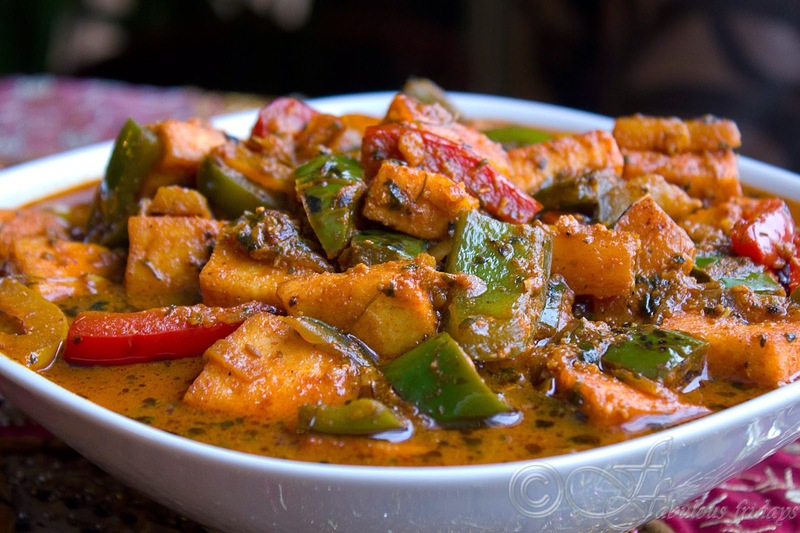 For a vegetarian version a blend of vegetable can be substituted for the meat. It is served with a side dish of Raita which helps cool the palette. This recipe calls for many dry whole or powdered spices. I have listed the ingredients in the order of their use while cooking. Heat oil in a large heavy bottomed pan. Take all the dry whole spices and coarsely grind them together in a mortar and pestle. Add these to the pan and let them spatter for 30 seconds. Add chopped onion and fry at medium high, stirring constantly till they turn pink. Add the chicken pieces and coat them well with the onion mixture. Fry for 2 more minutes. Add all the dry ground spices and 1 tablespoon of water and stir well. Reduce the heat a bit. At this point the aim is to infuse the chicken with all the wonderful spices while slowly cooking it. When the chicken is about ¾ done then add the yogurt and put up the heat. Continue cooking while stirring making sure nothing burns. After about 5-7 minutes the chicken will be almost done. The best way to tell is when you see the entire concoction leaving oil from all sides. At this point remove from heat. There should not be too much liquid in the pan and chicken should be surrounded by a little bit of gravy. Place the rice and measured amount of water in a pan and soak for 30 minutes. Place the pan on high heat and add all the other ingredients to it except saffron. Bring to boil and simmer covered for 6-7 minutes. Check the rice grain at this point. It should be only three quarters cooked, while most of the liquid should be gone from it. In a large greased casserole, layer alternately rice and chicken curry starting with rice. Take the saffron water and sprinkle randomly over the top layer of rice. Do not try to mix the rice and chicken together. Cover with foil and bake for 20 minutes till rice cooks completely.